27nov7:15 pm8:30 pmFlamenco dance classes in DecaturNo experience required. 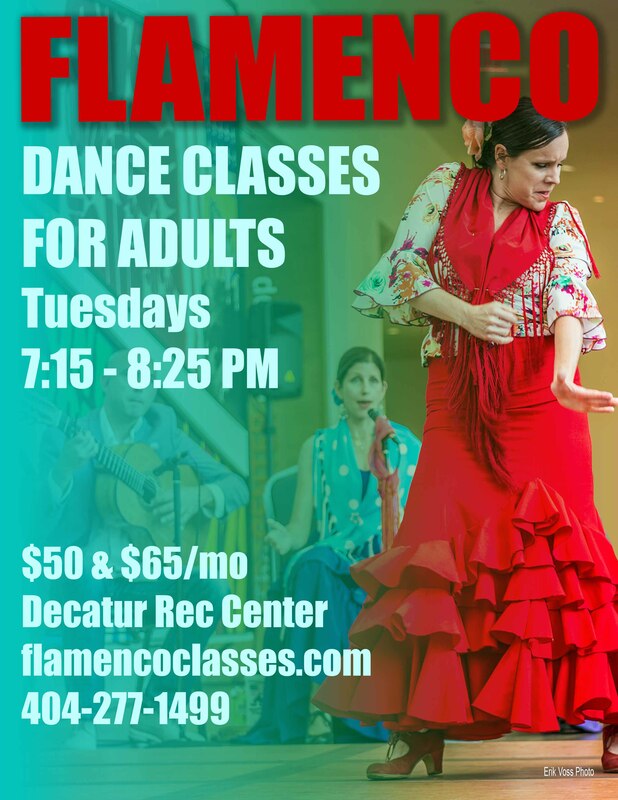 This class is for adults who wish to explore the lighter side of Flamenco, including tangos and bulerías in classes that focus on teamwork and communication. It is a good place for beginners, as well as those with experience who wish to add “the fiesta” to their repertoire. This class is geared toward dancers who want to dance without the worry of learning long choreographies or highly technical footwork. We spend time listening to music and exploring the relationship between the body, rhythm, melody, and space. Tuition: Payable to the Decatur Rec Center at the front desk when you enter the building. Rates are: $50/month for Decatur City residents and $65/month for non-residents. Tuition payments are non-refundable and non-transferable. Cash, check, cards accepted. Comfortable clothing and shoes with a small heel and great support (not those cute shoes you wear on a Saturday night out). Skirts are optional. Decatur Recreation Center, 231 Sycamore St., Decatur GA 30030. Free parking in the parking deck at the library located next door.